The Highway 99 tunnel’s north interchange, designed before the recent transit boom, could delay thousands of people, by making buses weave through general traffic. 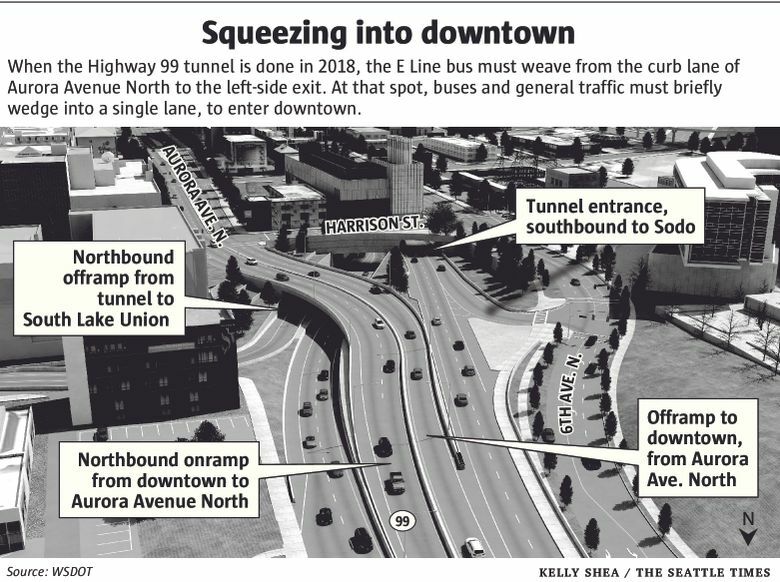 When the Highway 99 tunnel finally opens, as many as 15,000 bus riders a day might be slowed exiting Aurora Avenue North into downtown streets, because a new road design will force transit to weave across two lanes of general traffic. The design dilemma is an example of how megaprojects take so long to deliver that the culture shifts around them. When lawmakers in 2009 approved the $2 billion tunnel to replacing the Alaskan Way Viaduct, transit was not top of mind. But in recent years, Seattle has been overrun by growth in jobs and housing especially in the South Lake Union area — and transit use has soared. Highway 99 is closed this weekend in the South Lake Union area, from Valley Street to the Battery Street Tunnel, until 5 a.m. Monday. The work will allow traffic lanes to be shifted onto a new overpass, where contractors are finishing a future interchange. At the same time, state crews will close two northbound lanes on the Aurora Bridge for maintenance, from 5 a.m. to 5 p.m. Saturday; and two southbound lanes, from 5 a.m. to 5 p.m. Sunday. Aurora now provides dedicated bus lanes to speed up the RapidRide E Line, Route 5, and other lines serving more than 25,000 passengers daily, north- and southbound. In 2018, when the tunnel’s new north interchange opens, those bus lanes will fail to reach the new downtown offramp — where buses will mix briefly with cars in a single lane. Currently, two lanes of southbound Aurora continue to the viaduct, and two lanes exit at Denny Way. The missing link for buses could cause a bottleneck not just for bus passengers, but for motorists in the left lane. Government planners insist bus travel will improve — because of greatly improved stations and bus lanes just beyond the interchange, entering downtown. “The new configuration will bring new opportunities, not new barriers,” said Victor Obeso, service-development director for King County Metro Transit. Dave Sowers, the state’s deputy Highway 99 administrator, said he doesn’t think cars and buses will be worse off in the tunnel era than in the viaduct era. “The capacity on Aurora is going to be similar to what it is today, after the tunnel opens,” he said. However, a gap in transit lanes at such a critical location belies countless hours and dollars Seattle is spending to promote transit use. Beyond the new $60 car-tab fee and sales-tax hike to add bus hours, part of a $930 million “Move Seattle” property-tax levy this November would retrofit seven transit corridors, add walk-bike paths and “eliminate bottlenecks.” About half of downtown commuters take buses and trains, and regionally more than 600,000 passengers ride transit. State transportation Secretary Lynn Peterson expects to hold further discussions with the city. Working in the E Line’s favor is the state “yield to buses” law. Drivers do in fact cooperate on northbound Highway 99 in Sodo, and on the West Seattle Bridge, where bus drivers leave the Metro bus lanes to merge with general traffic. Government planners say they’ve tweaked the initial Aurora-exit layout, trying to reduce the effect of the chokepoint. That future left-side exit lane from Aurora will be extra long, while Aurora’s last E Line stop will be positioned more than a half-mile earlier, at Galer Street — allowing ample room for buses to merge left. Farther ahead, the agencies revised a piece of the single-lane offramp to slip in a second lane, which can be devoted to buses, Obeso said. And for buses returning north, a third surface lane near the onramp might allow buses to receive a head-start signal to bypass general traffic. State contractors are building four lanes on the Harrison Street/Aurora overpass — to allow a big hub station and east-west transit connections. “This is key to the multiple improvements that Seattle DOT (Department of Transportation) and our partners are looking at for the explosive growth in the South Lake Union area,” said Bill Bryant, city transit program manager. But even now, other blocks of Harrison are being outfitted with curbs, planters and even utility poles, shrinking capacity to two lanes. Traffic would crawl unless the city takes bold steps, such as making Harrison bus-only. “We haven’t gotten to that point,” Bryant said. In a pinch, Washington state could fall back on its four-decade history of wedging bus-carpool lanes and interchanges into tight spots. Obeso promised Metro will do what’s needed to keep its buses moving.